These are only available to members of the 1962 to 1965 Mopar Mail List Clubhouse. They are not for sale. If you want to make a donation to the club / 1962-1965 web site, the hat and sticker can be yours as a premium thank you gift for a donation of $25. BONUS! For a limited time your donation will get a 1962 to 1965 sticker for the window glass on your 1962 to 1965 Mopar! The default hat sent will be hat B, the hat on the right. Please indicate the hat you prefer. Difference? The hat on the left (hat A) has a half inch smaller triangle length and the bill of the hat is more curved. The text is slightly smaller since the triangle is likewise. The hat on the right (hat B) has a somewaht larger graphic so text in the triangle is likewise. The bill of this hat does not have as pronounced a curve. WINDOW STICKER ONLY: $1.00 donation each plus .50 cents postage (one time) if a mail list club member only wants a window sticker(s). NOTE: More postage is required to ship to non-U.S. addresses. Inquire at the below e-mail for specifics. 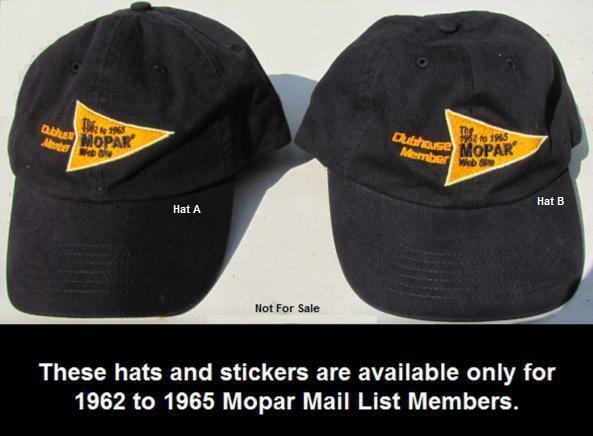 Thanks to 1962 to 1965 Mopar Mail List Club Member Nico for coordinating hat and sticker availability!